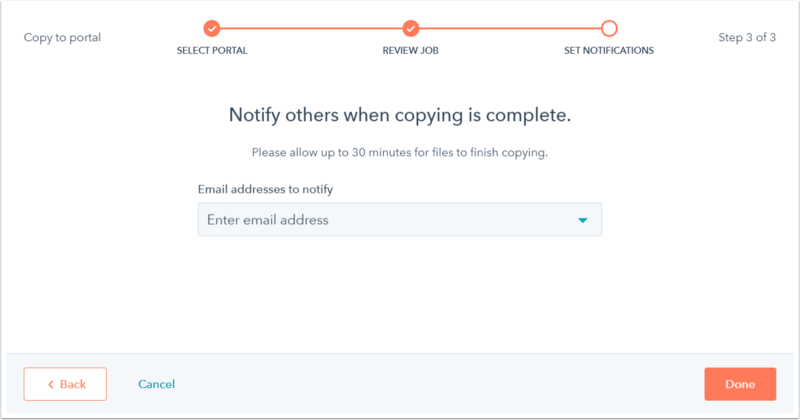 You can copy blog, email, or page templates from one account to another if you have access to multiple HubSpot accounts. Please note: you must be logged in with the same email address in both accounts in order to copy a template between the two accounts. You will not be able to copy purchased templates from one account to another. Click the name of a template to open it in the layout editor. Click the folder icon folder at the upper-left corner of the layout editor to open the finder. If you don't see the folder icon, this indicates that the finder is already open. Right-click the name of the template, then click Copy to portals, or click Actions and select Copy to portals. In the Copy to portal screen, use the Destination portal dropdown menu to select the account you want to copy this portal to, then click Next. 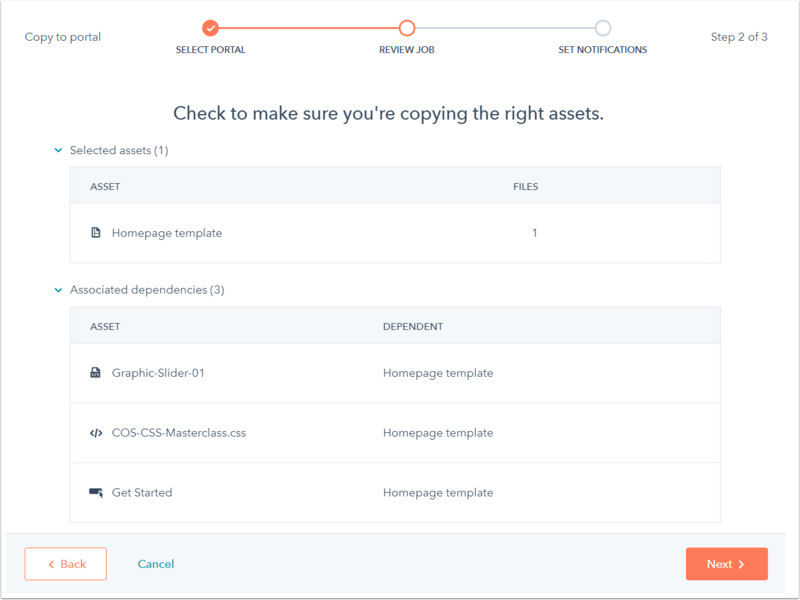 In the Review job step, check the selected assets and associated dependencies to ensure you're copying the right assets to the destination portal. If an asset or dependency already exists in the destination portal and you don't want to copy it again, hover over it and click Use existing. When you're done, click Next. In the Set notifications step, use the Email addresses to notify dropdown menu to choose an email address to notify when copying process is complete. You'll receive an email at the email address(es) you've selected to notify once the template has been copied to the destination portal. Copying a template from one portal to another will copy all dependencies by default. This includes any attached CSS files, global groups, custom modules, etc. Image files will not be moved over to the destination portal; they will only be linked to in order to maintain the same file URL, which originates from the source portal. This function can also be used to transfer coded files and custom modules to another portal. Copying a template does not create pages, it only copies the templates, included assets and dependencies.